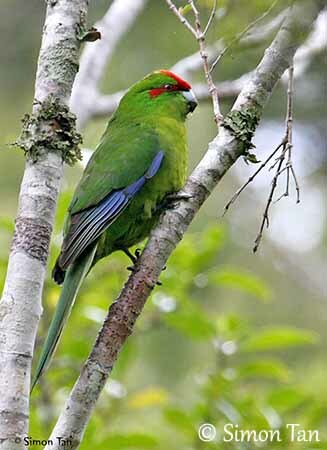 The Red-crowned Parakeet occurs mainly in lowland native forests, and today, the species is mainly seen on offshore islands, although the dense remaining North Island forest is still attractive for this pretty Psittacidae. 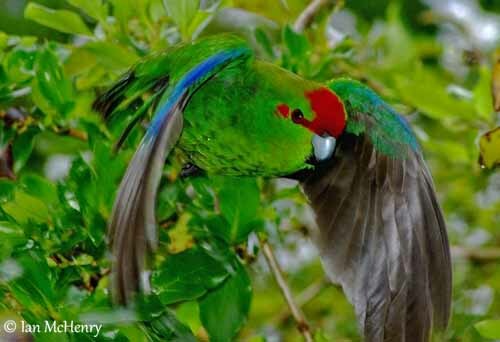 Its local Maori’s name is “Kakariki”. The adult of nominate race “novaezelandiae” has red forehead, crown, eyeline extending to the ear-coverts and patch on each side of the rump. The body plumage is emerald green overall. On the upperwing, the outer webs of the primaries are violet-blue. The extent of this pattern varies, depending on the subspecies. The green tail is graduated. On the underparts, the wing-coverts are green, whereas flight feathers and rectrices are greyish-black. The plumage is more yellowish than above. The bill is silvery grey with darker tip. The eyes are red. Legs and feet are grey-brown. Both sexes are similar but the female is slightly smaller than male. The juvenile resembles adults but the red head pattern is less-extensive. The tail is shorter and the eyes are pale brown. C.n. novaezelandiae (here described and displayed) occurs in New Zealand, including North I and South I, Stewart I, Auckland Is and several offshore islands. C.n. cyanurus occurs on Kermadec Islands. This race resembles nominate race, but with variable blue wash on the upperparts, including the uppertail. The underparts are more bluish-green. The flight feathers show darker blue outer webs. C.n. chathamensis occurs in Chatham Islands. This one has bright emerald-green face. The underparts are more yellowish. This race is slightly larger. The Red-crowned Parakeet may adapt to various habitat types, but it mainly frequents forest and their edges, scrublands and open woodlands. On the islands, it is found in open grassy areas or stunted scrub. According to the location, it occurs in heavily forested areas when available. 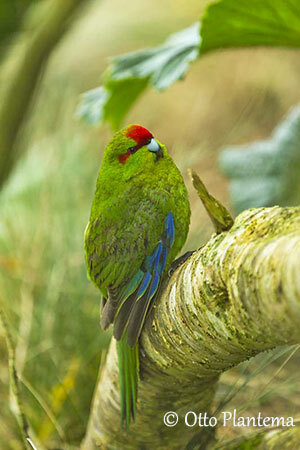 It is usually scarce on North I and South I, New Zealand, due to extensive deforestation. The Red-crowned Parakeet gives repetitive “kek-kek-kek-kek-kek” while flying or when alarmed. When feeding, it utters softer “kek-kik…kek-kik” and variants as musical babbling sounds. It also utters a shrill trisyllabic note or soft “tur-tur-tur-tur” when perched. The Red-crowned Parakeet feeds primarily on plant matter such as flowers, buds, fruits, leaves, shoots, nectar and seeds. It especially favours the flowers, buds and nectar of flax (genus Linum), but it also takes seeds, flowers and fruits from numerous other plant species. During the breeding season, it also takes invertebrates such as hemiptera. 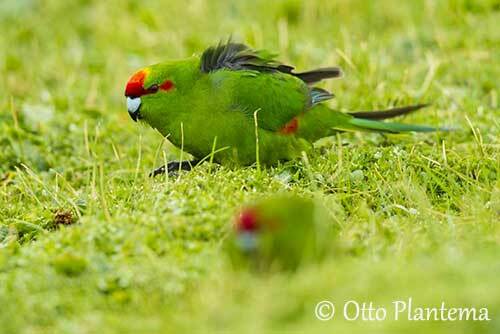 The Red-crowned Parakeet forages mainly on the ground and in trees. Like other Psittaciformes, it often holds the fruit or the flower in one foot while chewing. It is often seen alone or in pairs, but they may form small flocks in autumn and winter. The flocks can be larger at abundant food sources. They are more active in early morning and late afternoon. 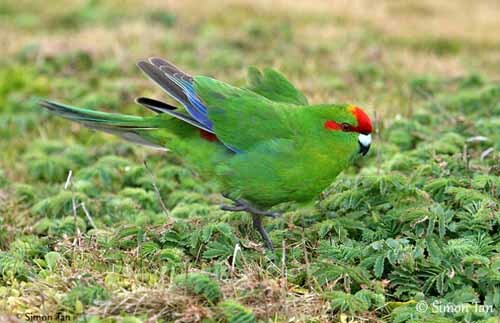 The green plumage makes them almost invisible when they are feeding among the foliage in trees. 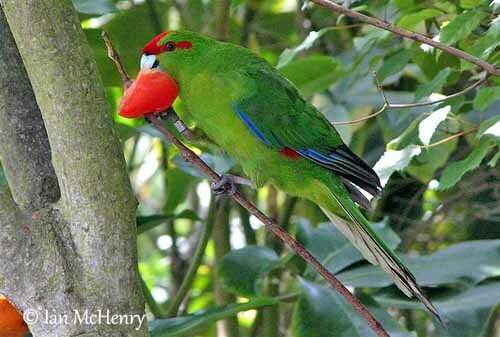 The Red-crowned Parakeet is territorial and gives loud advertising calls from exposed high perches. It can breed all year round and is a cavity-nester. The pairs have long-term pair-bonds and mates stay together throughout the year. This species is non-migratory, but it can fly long distances when searching for food. They travel between the offshore islands and often wander seasonally. The Red-crowned Parakeet has strong, fast, slightly undulating flight. It performs shallow wingbeats interspersed with glides. It is a strong flier and can travel through forests or over the sea between islands. When alighting, the tail is fanned. The breeding season can occur all year round. There is a peak between October and January, with some regional variations. 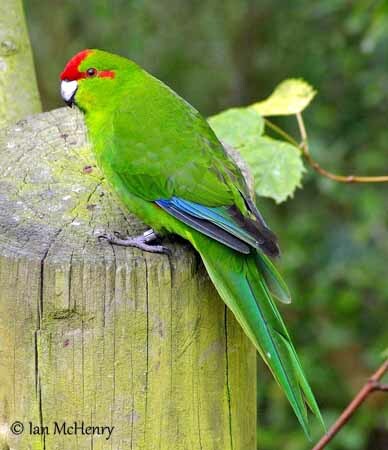 The Red-crowned Parakeet is a cavity-nester and uses hollows in branches or tree trunks, or holes in the ground, in talus slopes, also in cliff faces, or in burrow under thick vegetation. The female prepares the nest but the lining is often absent or only includes some leaves or feathers. 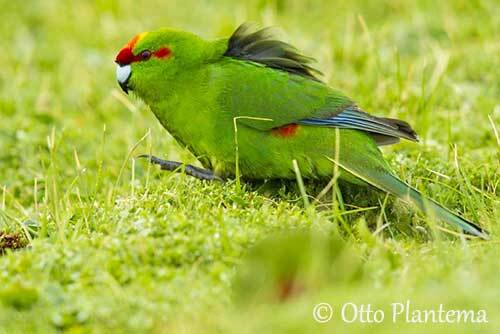 The Red-crowned Parakeet is vulnerable to predation by cats and stoats when it is feeding on the ground. 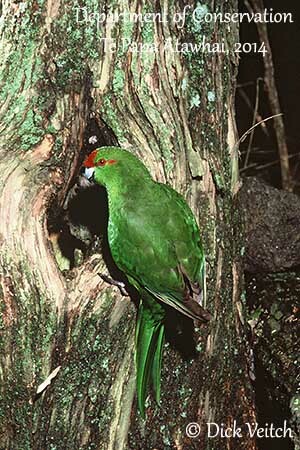 Competition for nesting-cavities with introduced species and habitat destruction with deforestation, have affected this species. The nominate race “novaezelandiae” has stable populations with more than 20,000 mature individuals. The race “cyanurus” include about 5,000/20,000 mature individuals. The race “chathamensis” has stable population but restricted range. 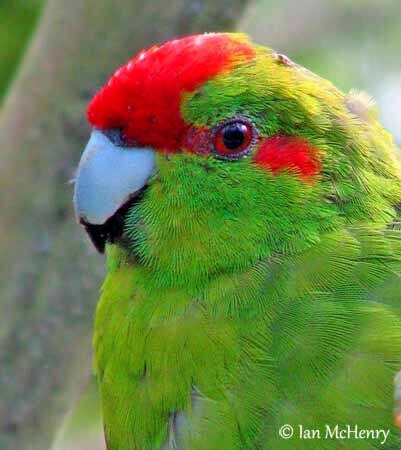 For these reasons, the Red-crowned Parakeet is listed as Vulnerable. The female lays 4-9 white eggs and incubates during 20-23 days. At hatching, the chicks have grey down. They are brooded and fed by the female during 10-14 days, with the food provided by the male. They remain at nest during 32-49 days, depending on hatch order. Both parents feed them until they fledge and become independent.